Welcome to the National Shrine of St. Thérèse, Juneau, online. The National Shrine of St. Thérèse, Juneau, is a ministry of the Diocese of Juneau and is located approximately 22 miles north of downtown Juneau. The Shrine has welcomed people of all faiths and all corners of the world for 80 years. Thank you for visiting the National Shrine of St. Thérèse, Juneau, online. 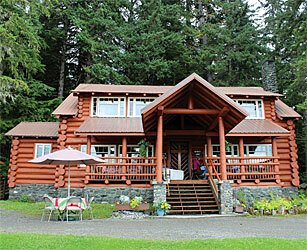 Located in an area of exceptional beauty and solitude, the Shrine will be a place of spiritual refuge and retreat for the Diocese of Juneau, other religious groups, and when possible, for other groups utilizing it with reverence and care. 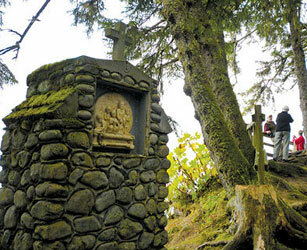 The Shrine is dedicated to St. Thérèse of Lisieux, the patron saint of Alaska, missionaries, and the Diocese of Juneau. She is known for her Little Way and in her autobiography, The Story of a Soul, she wrote that what really mattered in life was not our great deeds, but our great love. 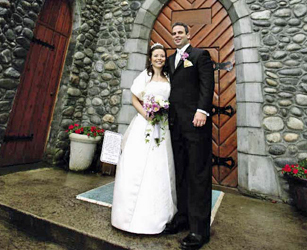 The National Shrine of St. Thérèse, Juneau, began as the dream of Fr. William G. LeVasseur, S.J. (Society of Jesus, or the Jesuits). From the beginning, the Shrine has been a labor of love and touched many people around the world. The National Shrine is located in Tongass National Forest, approximately 22 miles "out the road" north of downtown Juneau. Our street address is 21425 Glacier Highway, Juneau, Alaska 99801. Our hours are 8:00 am - 10:00 pm in the Summer months (May - September), and 8:00 am - 8:00 pm in the Winter months (October- April). If you have navigated around this website and still have a few questions, then this Frequently Asked Questions (FAQs) section may be just what you're looking for. Here we provide answers to the most commonly asked questions, and in some cases, information that simply doesn't fit anywhere else. The National Shrine of St. Therese, Juneau, is a ministry of the Diocese of Juneau, but it is not sponsored by the Diocese. There is always work to be done at the Shrine from renovating the buildings to upgrading our water treatment systems to planning for the future. Donations can be made towards a specific project, general operating fund, or in honor/memory of a loved one. 100% of donations go directly to the Shrine.